The other day, Ben and I were in a park and headed over to the swings. A mom was there with her son. Ben had no interest in getting into the swing, he just wanted to push it back and forth. "How old is he?" I asked. He was Ben's age, and her first child. We chatted as I tried to keep an eye on Ben and make sure the swing didn't conk him in the head. A couple of minutes later, Ben trotted over to the adaptive swing and started pushing it. "That swing looks scary to me," the mom said. "It's a swing for children with disabilities," I explained. "They may not be able to sit on those backless swings because they need support, and this kind puts them in a comfortable position." And that was that. We started talking about how dirty the boys had gotten from all the mud, and I didn't bring up that I had an older son with disabilities. Then Ben zoomed over to the jungle gym because he doesn't like to stay in one place for longer than 1.5 minutes. So many thoughts flooded my head as I watched Ben scramble around. If I'd never had a child with disabilities, I also might have been clueless about the big blue swing. Growing up, I knew very little about the lives of PWD. These days, there's a lot more awareness and knowledge but still: there are people who have no idea why those big swings exist in parks unless they see a child with disabilities using one. I am so grateful for their existence. When I was a kid, there were no swings like that in parks. Even when Max was a little guy, they weren't in parks near us so we got him one in our backyard. Now, more cities are making parks accessible, which is long overdue. Before I had children, I never envisioned myself living in the world of big blue swings. You automatically become a citizen when you have a child with disabilities, but you might very well morph into an ambassador, eager to help people understand the need for including people of all abilities. Standing in the park that day, it felt good to give the other mom that explanation. 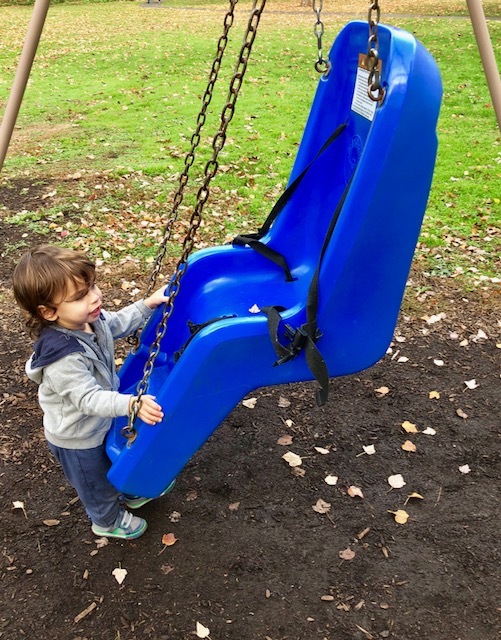 There is one more person out there who knows about big blue swings, and maybe that doesn't seem like much but to this mom, it is. love this - thank you! I feel the same way. We have one of those swings in a park near me. There was some pushback because they had to remove some regular swings to install it. The irony? EVERYONE loves using it, and it gets much more use than the other swings ever did. Unfortunately, some adults tell typical kids off if they see them using it (and this is when there are no kids with disabilties in the park!) It's like they get joy from telling typical kids the swing is "not made for them." Loved the part about citizens and ambassadors, Ellen. There are lots of very cool yellow swings which are known as Liberty swings. Service clubs build them a lot. So the wheeled citizens of Wheelers Hill have one in Jells' Park for instance. And these back-y swings are good. They remind me of car seats, and every child sits in a car seat, yes? [American and European children have somewhat stricter requirements than Australian ones do, it seems]. This is so well written. We're in the same boat as you, adding a big blue swing to our yard for Christmas, but I feel like I try my best to educate people whenever I can! And in a backyard it's so much more intimate and social. I was lucky. I had swings made for me through the 1980s and 1990s.